Magnetic paints promise to make a wall that magnets can stick to. Do these products work? How strong are they? Which magnets should I use for the best results? Magnetic paint or primer is just like regular paint, except that tiny particles of iron dust are mixed in. When you paint it on a surface, you end up with a layer of dark primer with many tiny flecks of iron spread throughout. Magnets are attracted to these bits and pieces of iron. Most instructions on these paint products suggest that very thorough mixing is important. Left alone on the shelf, the iron particles will tend to settle to the bottom. Mix it thoroughly to ensure the layer of paint has iron particles spread throughout. The finished surface of magnetic paint is not a smooth surface. To test the performance of magnetic paint, we bought some and tried it ourselves. We carefully followed the instructions on a test board. 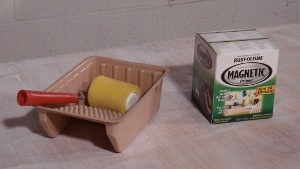 Three layers of Rust-Oleum magnetic primer were applied using a foam roller. One layer of latex paint was painted on top. The one 30 fl. oz. can claims to cover 16 square feet, which seemed about right. On the dark primer, one top layer of paint isn't quite enough to cover it. Cosmetically, you probably want to use more paint. For each layer of non-magnetic paint you add, though, the weaker the magnetic attraction will be. Each layer of non-magnetic cover paint pushes the magnet farther away from the ferromagnetic flecks of iron. In our tests, we were more concerned with magnetic performance than cosmetic beauty, so we stuck to one layer of paint. Many folks who use this primer complain of the surface roughness. When it dries, the surface is quite bumpy. It seems to be the nature of magnetic paint. Because it's so rough, we wouldn't recommend combining it with the paint that creates a chalkboard. The bumpy surface would be difficult to write on and clean well. The D82 disc magnet is a strong disc that's a bit strong for a refrigerator magnet. It attracts to a big, thick steel plate with 6.44 lb of force (Pull Force, Case 1). Stuck to our refrigerator door, the pull force is about 3.4 lb. It's lower because the sheet-metal steel surface is thinner than a thick chunk of steel. The layer of paint on the refrigerator also plays a big role, putting some distance between the magnet and the steel. On our test board, the same D82 disc magnet attracts to the magnetic paint with only 0.3 lb of force. That's not much! It sticks, but much less than you'll see on your refrigerator door. You can hang a single piece of paper with it, but not with a great deal of strength. Dissatisfied with the poor strength results, we wondered: Would more paint help? If the limiting factor is the tiny amount of iron for the magnets to attract to, what if we doubled it? To find out, we applied three more layers of magnetic primer on top of the first three, for a total of six layers. The results were much more satisfying. It's still not nearly as strong as a thin sheet of steel, but it's workable. At six coats of paint, expect the can to only cover 8-10 square feet. It's sometimes hard to intuitively grasp what the difference is between 3 lb and 0.3 lb. Sure, one number is lower, but will it hold a magnet? Check out this video to see a few different magnets in action on our test wall. 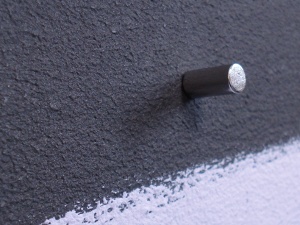 Our big thumbtacks like XLTK-BLU work quite well They are our first choice for use with magnetic paint. They're strong, easy to handle, and come in several colors. The smaller thumbtacks like TK-BLU will work, but won't hold up anything that's very thick or heavy. They just feel a little weak. Other great choices include simple cylinders like the D48 or D58, or plastic discs or cylinders. Discs like D84PC-AST come in many colors, while the D8APC-BLK has an easy-to-grab height. OK, but what if I use really big magnets? The limiting factor with magnetic paint isn't the magnet -- it's the tiny amount of iron in the paint. Once the iron is saturated (holding as much magnetic flux as it can), adding more magnet won't provide any more strength. You can get a little more strength if your magnet covers more surface area, but not much. We tested a few larger magnets, like DC6 or DX06 discs, with results in the 1-2 lb range. That's not much stronger considering how powerful these magnets are. These strong magnets are not recommended for a magnetic painted wall. Because the attraction to the paint is so weak, two of these magnets will slam together if allowed to get close to one another on the wall. Magnetic paint does work well in some situations. If you can use an actual sheet of steel or a magnetic whiteboard, you will get a stronger hold from your magnets. 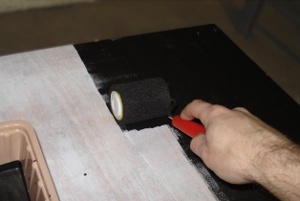 If you do use magnetic paint, try doubling the recommended number of coats for a stronger hold. Don't stick a strong magnet in the wet paint. You'll get a very cool looking mess! Check out how the paint shows the magnetic field lines coming out from the pole in the video below.